Tee's Blurbs: Travel Keepsakes: Photobooks! I'm a sucker for travel and keepsakes. Every time I travel, I always bring back a souvenir with me. Additionally, as part of my collection, I bring back a travel magnet for every country I visit. These magnets are still tucked in somewhere, as I am still looking forward (and daydreaming) to someday have our own place where I'd have space to display them. Trivia: These magnets and some keepsakes made their way into our wedding photographs. The best keepsake I have which is travel-related are photos taken of the trip. Being the shutter-bug that I am, I always end up with hundreds of photos of the food, culture, places and tourist attractions we've visited. Truth be told, I feel incomplete without my camera and without snapping a photo here and there. For me, it'd feel like as if I was never there, eeep! I could recall a tanga moment where I accidentally left my camera behind in my cousin's car in Melbourne. We had to travel back again to her place (yes, J and my sister had to tag along) on the last train (travelling about 1-1.5 hours, mind you!) just to get it because I felt so lost without it! While all these travel photos probably will not see the light of day, there's always a select "favorite" photographs I share online through blog or social media. But even social media platforms come and go, something I learned from the good ol' Multiply days. Old-school as it may be, I still find myself captivated and lingering over poring through pages of printed photos in albums. No matter how technology has impacted our lives, some things are still better left old-school. 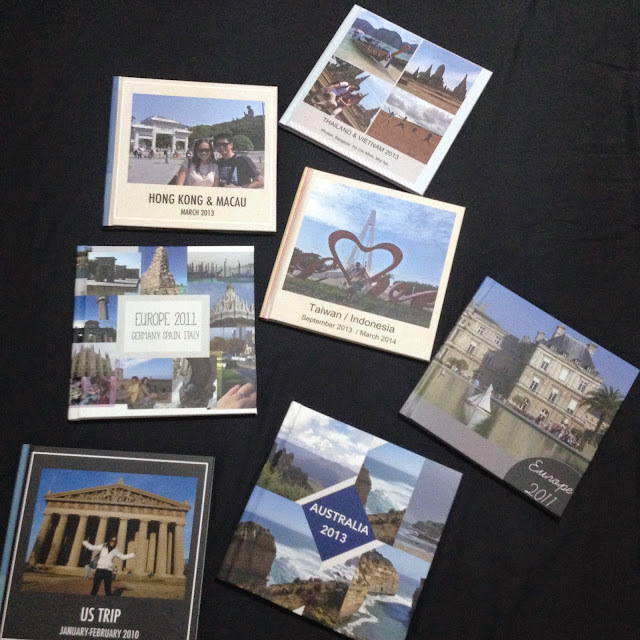 My latest project: completing years' worth of travel photos and compiling them in nice, pretty photobooks. I am proud to report that all major travels up to present have been accounted for. And I say "all major travels" because I didn't include trips to weekenders at Malaysia and Indonesia and other trips that didn't have high resolution photos. These were my very first travels and I should've known better. Boooo! Double BOO! Lesson Learned: Always take (and save) in high resolution photos. 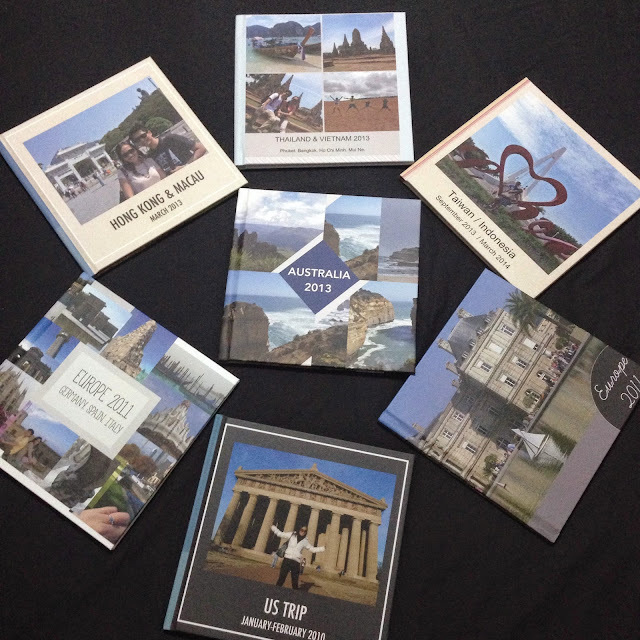 This is definitely a must for a traveler who loves snapping photos like me. This is a huge feat for me - completing and documenting my international travels, especially after our Europe 2011 stint and the 2013 Travel Year. Anyhow, here's a peek of my growing photobook collection. For a list of where I've been including travel blog links, click here.